That was one of the strangest, most wonderful things I’ve ever heard. Great job everyone! This turned out really well. My compliments to Josh especially, as I know how hard he worked on this bad boy. Thanks the Diad! Why's it gotta be a boy though. Great job everyone! This turned out really well. My compliments to Josh especially, as I know how hard he worked on this [NASTY WOMAN]. Wow! Awesome! 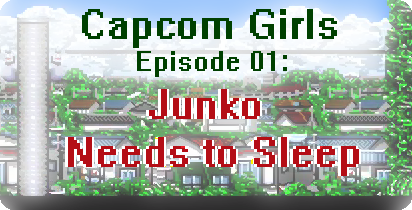 I can't believe the dream of Capcom Girls has finally become a reality! This creative project is so niche, that it really feels like a privilege to be a member of its small target market. It was like receiving a personalized gift from someone who, ya know, like really gets you. In fact, I felt like the inclusion of music from Ide Yousuke Meijin no Jissen Mahjong was put there specifically just for me. It was a delight to hear Josh's imagination of the lives of the Capcom Girls back in the early days of their careers. I loved having all these familiar podcast voices do the voice acting for the characters. And of course, the soundtrack, was AMAZING. This all was a real treat. Oh man, this was SO GOOD! I had a big dumb grin on my face the entire time. I love how you essentially made a backstory for the legendary Capcom Girls picture (which still mesmerizes me to this day). I wouldn't be surprised if the personalities of the composers here were close to how they actually acted back in the day. Give yourselves a nice pat on the back, you deserve it!